Believers, once again we see how much our Father in heaven loves and treasures us. And again, it makes us wonder why we even ever worry about anything. This verse tells us that even though He loves all His creation and cares for it, He values those who have accepted His Son more. Those who believed and received His Son, are beloved of the Father. They are dear to His heart, cherished, special, highly regarded. They need not worry or fear anything for the Father holds them in His hands. He gives them all things they need. He tells them over and over what their worth is and that He has special plans and purposes for them. 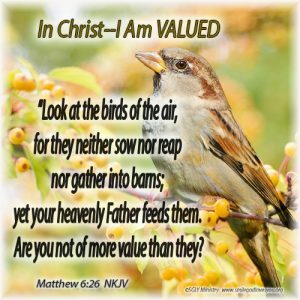 Believers, we are so valued and treasured by our Father in heaven, we need not every worry or fear. Paul says in 1 Corinthians 6 that someday we will judge the world and the angels, so that is something we should consider, something that means we must be highly regarded by God. Let’s live today as God sees us—as treasured, valued people in Christ.